With the approaching 88th Anniversary of the Dedication of the new Cathedral of Saint Joseph, a reprise of the Cathedral Conundra is offered, in a slightly expanded format. Any topic suggestions or questions for the conundra are welcome and may be submitted to our gentle editor, Signor Vescovo. The Cathedral of Saint Joseph is home to Wheeling’s oldest Catholic parish, dating to 1822 and Mother Church to the city’s other parishes. 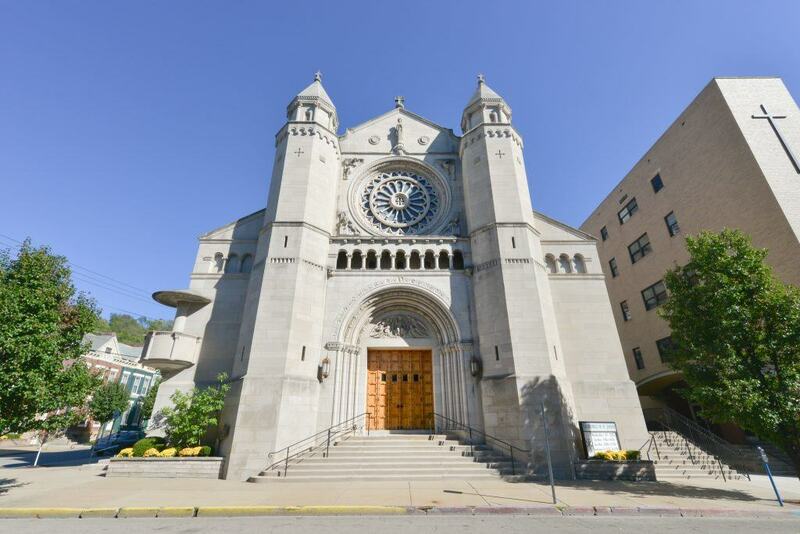 It has been the liturgical heart of the Diocese of Wheeling (originally) since the Diocese’s erection by Pope Pius IX in 1850 and is an architectural and artistic treasure in both the city and state. The name cathedral derives from the church which houses the bishop’s cathedra or official seat of teaching and governing authority. In 1847, the Cathedral was moved from its former location further south to the corner of Eoff and 13th Street, and the Church was titled to Saint James the Apostle. The Cathedral Rectory still recalls this name in some of its decorations, the St. James’ pilgrim shell clearly repeating throughout the first floor of the building. (Image – Pope Emeritus Benedict XVI’s coat of arms with St. James’ pilgrim shell in the lower portion). In 1805, St. James became the Cathedral of the Diocese, with Bishop Richard V. Whelan as the first bishop of Wheeling. In 1872, in response to the rising devotion to Saint Joseph, Husband of Mary throughout the universal Church and the burgeoning labor movement among the Catholics of the coal fields, Bishop Whelan petitioned Rome to change the title of the Cathedral to honor Saint Joseph . Bishop Patrick Donahue became Bishop of Wheeling in 1894. Monsignor Thomas Quirk records in his journal, after returning from the Consecration at Wheeling, that there “was much talk about a new Cathedral.” However, it seems that planning did not begin in earnest until after the Great War. Bishop Donahue conceived a design and began to interview possible architects, eyeing Edward J. Weber of Pittsburgh, a rising star in Church architecture, as a likely candidate. Bishop Donahue’s death in October 1922, before work had even begun may have scuttled all plans, were it not for a serendipitous fire in 1923 that did significant damage to the Cathedral structure. […] to build not for a few years, for fifty years or a hundred years, but to erect a building that would stand for hundreds of years and be a beautiful legacy which the present congregation would bequeath to future generations” (West Virginia Register 12/30/22). In 1973, Bishop Hodges, the fifth Bishop of Wheeling (later, Wheeling-Charleston) oversaw renovations made to the liturgical space according to the norms set by the Second Vatican Council: the main altar was brought forward and centered under the dome, the original ambo (pulpit) and communion rail were removed, and side pews were reoriented to face the central altar. Bishop Schmitt, the seventh Bishop of Wheeling-Charleston, undertook extensive renovations and restorations to repair the building’s interior finishes and adapt the interior to contemporary liturgical needs. This project included: cleaning and conservation of murals and restoration of the painting of the interior; construction of liturgical furnishings to match original woodwork; installation of handicapped accessibility throughout the interior and exterior; new heating, cooling, electrical, lighting, and sound systems; construction of new baptismal fountain; restoration of floor tile and slate on altar platforms, refinishing floor under the pews; and construction of an addition with a kitchen and restrooms, and restoration of courtyard. This period of restoration was completed in 1996. A new period of restoration and renovations began in 2006, with the extensive works being carried out on the Church’s roof and external windows, to provide a watertight structure, as well as to the original furnishings of the upper sanctuary, allowing the original Cathedra to be restored to liturgical use. A restoration of the stained glass throughout the Cathedral has been ongoing for the last seven years in addition to smaller restorations of the side altars and church furnishings. In 2012, important works were carried out in the sanctuary, installing a new floor, altar, and ambo designed in a language and materials drawn from the original high altar, designed by Mr. Weber, as well as restoring the pews throughout the Church. At the same time, Mr. Weber’s inscription, in the Church’s main portico, was restored. In keeping with his inscription, pray for him, for our Bishop, and for the people of our Parish, as the 88th Anniversary of the Cathedral’s dedication draws near.